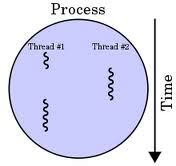 In the post Python threading – an intro I introduced something about python threads, I explained the GIL (Global Interpreter Lock) and how to instantiate workers and timers. The GIL is the topic you must know to take full advantages from python threads. Since the module “threading” is implemented in an object oriented way, every thread corresponds to an object and you can easily subclass it. Daemons are only useful when the main program is running, and it’s okay to kill them off once the other non-daemon threads have exited. Without daemon threads, we have to keep track of them, and tell them to exit, before our program can completely quit. By setting them as daemon threads, we can let them run and forget about them, and when our program quits, any daemon threads are killed automatically. Python threading module provides the enumerate method to retrieve a list of all Thread objects currently alive. The list includes daemonic threads, dummy thread objects created by current_thread(), and the main thread. It excludes terminated threads and threads that have not yet been started. Signaling is useful to wake up threads when a new event is received by a program. To receive the signal I’m going to subclass threading.Thread adding a wait_for_event method. The init method shall accept the event object as parameter then the method wait_for_event shall call the evt.wait(). @brief this the main function of the thread class.